This Southern-style cornbread dressing recipe is made the classic, old-fashioned way with fresh cornbread crumbs and optional diced chicken. For best flavor, stew a fresh cut-up chicken* and use the broth and meat for this stuffing. The dressing is baked in a large baking pan, which is the recommended method. 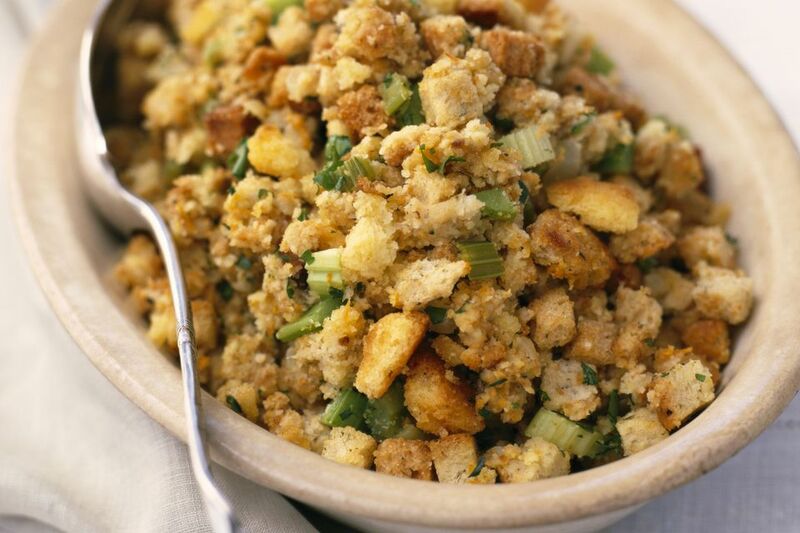 If you choose to cook the stuffing in the bird, see Turkey Basics: Stuffing the Bird Safely. Heat oven to 375 F. Grease a large, shallow baking pan or roasting pan. In a large mixing bowl, combine the cornbread and white bread crumbs. In a deep skillet or medium saucepan over medium heat, saute the onion and celery in the butter until tender. Do not brown. Combine the sautéed vegetables and butter with the cornbread and bread crumb mixture. Stir in chicken broth, using enough to moisten. Stir in the diced chicken, if using, and the seasonings. Before adding the eggs, taste and adjust seasonings. Add the beaten eggs and mix until well blended. Spread the mixture in the prepared baking or roasting pan. Cover the pan tightly with foil and bake for 25 minutes. Uncover the pan and cook for about 20 to 25 minutes longer. How to Stew a Chicken - Place 3 to 4 pounds of chicken pieces in a large stockpot or Dutch oven. Cover with water and add 2 teaspoons of salt, 2 bay leaves, 1 cup of chopped onion, and 1 clove of garlic, minced. Add fresh or dried herbs, as desired. Bring to a boil. Cover and reduce the heat; cook for about 1 1/2 hours, or until the meat is falling off the bone. Remove the chicken from the bones and chop. Strain the broth and skim off fat. You can also brown the chicken pieces first for the extra flavor, and feel free to add carrots, celery, peppercorns, a small amount of lemon juice or a cup of dry white wine, etc..
Use 2 tablespoons of a good quality poultry seasoning blend and omit the sage, thyme, marjoram, and rosemary.